Comments: Evergreen conifer native to western Canada, the western states of the US, and the mountainous regions of central Mexico. 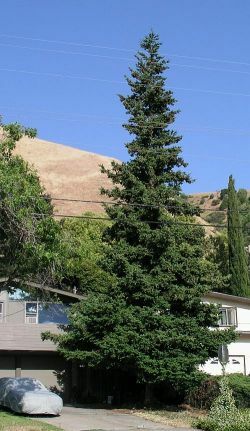 In California, this tree's native range is the coastal region from the Oregon border to Santa Cruz County, and the Sierra Nevada Range north of Yosemite. This species has 1" long blunt green to blue-green needles which surround the branchlet, 4" long papery cones which hang below the branch, and dark gray to brown furrowed bark. This species is second only to the Coastal Redwood in height, and is certainly the largest of the pines.